Advanced Features Take Industrial Weighing to the Next Level Ranger 7000 has ten advanced application modes for a variety of complex applications which minimize the need for manual calculations, and can also control peripheral devices and/or a scale platform with option kit. Fast Performance and Legal for Trade Certifications assure Accurate Results With a one second stabilization time, up to 75,000d or 350,000d display resolution and legal for trade certifications, Ranger 7000 provides the precision that cannot be matched by any scale in its class. Sturdy Industrial and Modular Design Support Flexible and Heavy-Duty Use Ranger 7000 was developed to thrive in rugged and harsh industrial environments. 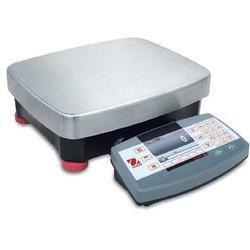 This modular scale was built with IP54 cast metal housing and sealed metal indicator to ensure durability. Cutting-Edge SmarText 2.0 Software Powers the Technologically Advanced Ranger 7000 With SmarText 2.0 software and a 4.3 inch graphic display, the advanced functionality of Ranger 7000 is simple to use with minimal training. With ten advanced application modes, including formulation and density weighing, Ranger 7000 can meet the weighing and measurement needs of practically any industrial application or manufacturing process. Many application modes eliminate the need to do long and complicated manual calculations. 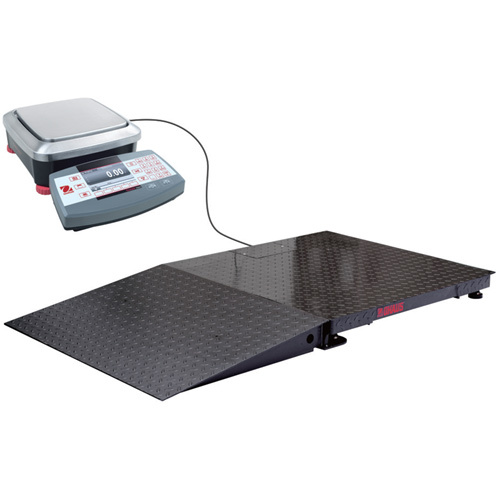 With the remote base option, you can connect a floor scale platform or bench scale base with higher capacity in order to achieve precise results for a job of any size. Results from both scales can be displayed at the same time. Ranger 7000 can control many peripheral devices through the optional Discrete I/O interface (provides 2 input ports and 4 output ports), which can be used for accurate weight measurement in filling and checkweighing applications. No matter which version you choose, you can be guaranteed that your results will be available in just one second from the time the load is placed on the platform, improving operator efficiency, productivity, and throughput. 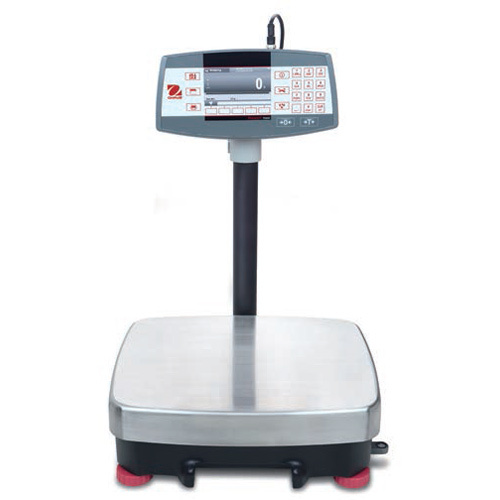 This ideal combination of features ensures two of the most important aspects of your weighing results: that they are highly accurate, and delivered quickly. 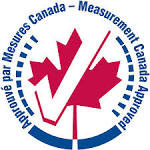 All Ranger 7000 models meet or exceed the Class II / Class III accuracy requirements in accordance with NIST Handbook 44 and Canada Weights and Measures Regulations. 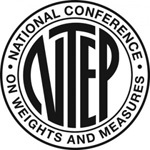 Weighing Determine the weight of items in the selected unit of measure. *A statistics feature can be used in conjunction with weighing mode in order to compare the relative deviation of a number of samples and other statistical data. Parts Counting Count samples of uniform weight. Advanced auto-optimization software recalculates the average piece weight as the overall weight increases. 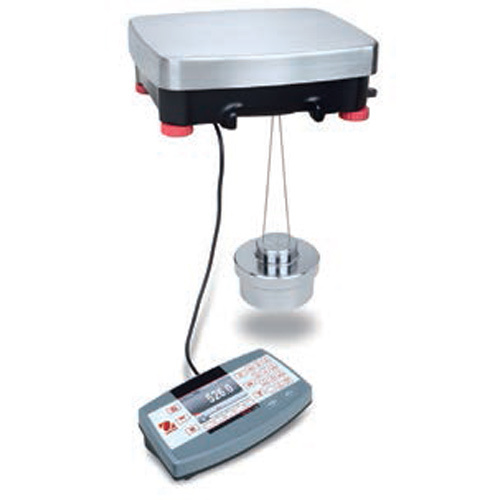 Dynamic Weighing Weigh an unstable load. Scale takes an average of weights over a period of time. 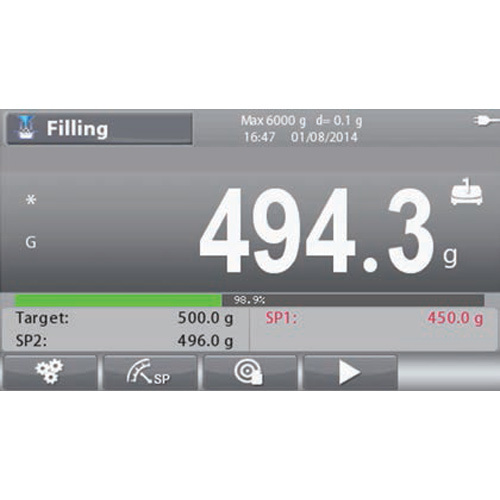 *A Display Hold feature manually or automatically holds the last stable weight on the display. (Activated by setting time interval of Dynamic Weighing to zero.). Check Weighing/Counting Compare the weight/count of a sample against target limits. Connect with Discrete I/O option kit for external check lights. 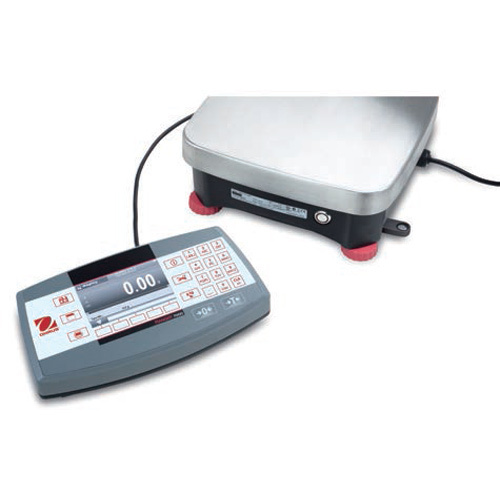 Percent Weighing Measure the weight of a sample displayed as a percentage of a pre-established Reference Weight. It is a common knowledge that industrial scales are not always delicately handled and Ranger 7000 was built to withstand heavy duty usage. Ranger 7000 has a die-cast sealed metal indicator and housing, ensuring its accurate and long-term operation in even the most demanding industrial environments. The indicator can be separated from the platform and mounted to the wall or bench with the optional mounting kit accessory, allowing you to customize the placement of your scale based on the size and setup of your workstation. The SmarText 2.0 interface will have you easily using the Ranger 7000 for all of its unique and advanced features quickly. SmartText 2.0 makes an advanced scale very simple to use, and will greatly reduce training time for operators. It is also simple to set up and can be configured with just a few button presses. Ranger 7000 has a bright backlit display and navigation panel that is comprised of a keypad with 5 quick, 8 function, and 12 alphanumeric keys and a 4.3 inch graphic display, which can be operated in multiple languages. 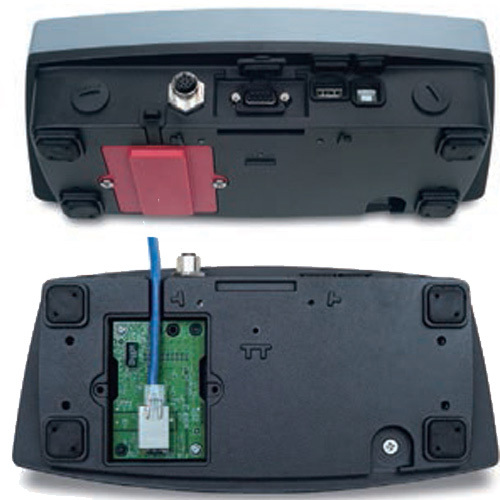 The data produced by Ranger 7000 can be easily exported through the standard RS232 or USB device port. 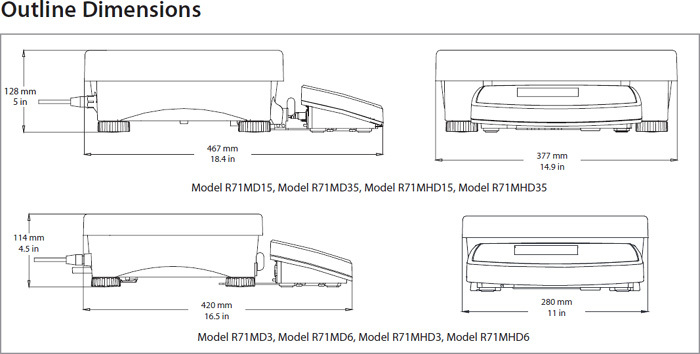 Additional connectivity options include a second RS232 or Ethernet, and standard USB host port for bar code scanner or flash drive. Through the RS232/USB/Ethernet and barcode scanner, a complete inventory control system can be set up through a single scale, considerably reducing the investment associated with more complex systems. With full GLP/GMP data output, Ranger 7000 can help meet traceability and compliance requirements. Removable stainless steel platform, check weighing lights with selectable operation and audible signal settings, integral weigh below hook, sealed front panel, menu lock switch, level indicator, adjustable leveling feet, six selectable operating languages (English, Spanish, French, German, Italian and Chinese), selectable environmental and auto-print settings, stability indicator, overload/ underload indicators, selectable brightness settings, auto-dim, auto-sleep, auto tare, chain tare.